One moot court national championship in an academic year is reason to celebrate. Two national championships are bragging rights for the year. Three national championships in one year bring unprecedented excitement to a moot court and trial advocacy program on its way up. From left, LSU Law’s National Admiralty Law Moot Court Competition “Purple” team coach Dean Sutherland, Jessica Finley, Jacob Cunningham, Sara Kuebel, and coach Phillip Smith. Three traveling moot court teams from the LSU Law Center took home national championships at their respective competitions during the 2017-18 academic year. In October, LSU Law won the Peter James Johnson National Civil Rights Trial Competition in New York City. Then, on March 24, LSU Law teams won the 2018 John R. Brown National Admiralty Law Moot Court Competition in Seattle and the Manfred Lachs Space Law Moot Court Competition’s North American regional rounds in Washington, D.C.
With the announcements of LSU Law’s victories coming 30 minutes apart, that March day is one that will stick with LSU Law professor Jeff Brooks, who also serves as the Preis PLC Director of Advocacy and Professional Practice and Director of Field placement and Moot Court/Trial Advocacy Programs. While LSU Law is no stranger to winning national championships in external competitions, three in one year is a rare feat — the last time LSU Law won three national championships was 2006. That success has created a new excitement around campus for the moot court and trial advocacy program. That cheer is not limited to just current students. 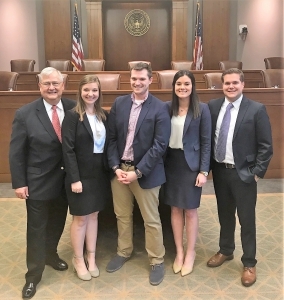 When, for the third time in four years, LSU Law won the Admiralty Moot Court Competition, the team’s coach, Dean Sutherland, emailed former students and former members of the Admiralty team to tell them the news. When the current students got off the plane from Seattle, they were swarmed with messages of congratulations on their phones. The winning teams’ pride is the best endorsement for the external competition teams going forward, Brooks said. Before the 2017-18 school year ended, he had students approach him asking when tryouts will be for next year’s teams, what they can do to better prepare to be on a team, and what problems they will get to brief and argue next year. 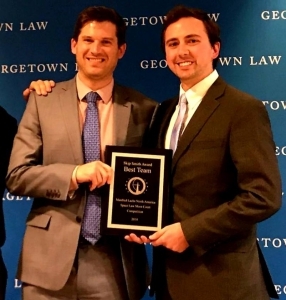 LSU Law students Zach Miller, right, and Max Roberts were crowned champions of the Manfred Lachs Space Law Moot Court Competition’s North American regional rounds in Washington, D.C., on March 24. One team is already at work preparing for its next competition. 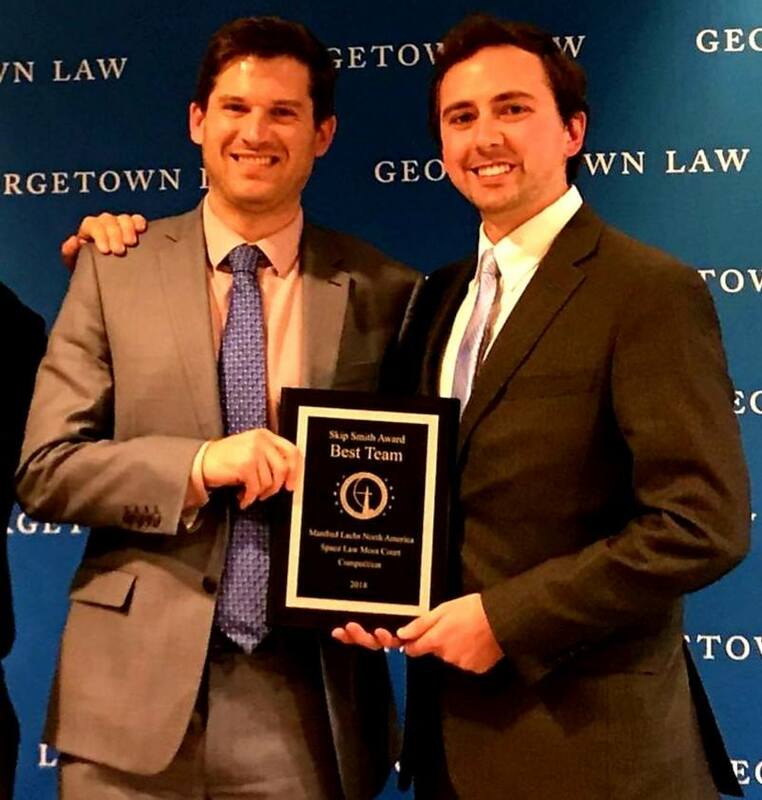 By winning the North American regionals, LSU’s Space Law team of Zach Miller and Max Roberts advances to the World Championships of the Space Law Court Competition, which will be held in October 2018 in Bremen, Germany. LSU Law will face the winners of the European, Asian-Pacific, and African rounds for the chance to be World Champs. The three national championships are just the tip of LSU Law’s success in external competitions this year. The National Environmental Law Moot Court Competition team of Kelsey Balzli, Molly Reinhardt, and Patrick Voelker were national finalists; the Tom Fore Phillips National Moot Court Competition Team of Jonathan Cobb, Chaz Coleman, and Ashley Delaune were semifinalists; LSU Law’s second Admiralty team of Mary Kathryn Gimber, Clinton Smith, and Josie Serigne were quarterfinalists; the Stutes-Kalinka National Tax Moot Court Competition team of Mary Elizabeth Ingram, Jacob Irving, and Russ Stutes were quarterfinalists and runners-up for best brief; and the Domenick Gabrielli National Family Law Moot Court Competition team of Chris Alderman, David Scotton, and Aimee Simon were octofinalists. Also, two teams — the Admiralty team of Cunningham, Finley, and Kuebel, and the Moran-Thrash ABA National Appellate Advocacy Competition Team of Kaylyn Blosser, Torrie Lawson, and Daniel Price — won best brief at their respective competitions. “That is a real testament to our Legal Writing faculty’s teachings and to the hard work our new Advocacy Fellow, Annie Scardulla, has put in on expanding our brief-writing training opportunities this year,” Brooks said. Propelled by its competition success, LSU Law’s Moot Court program learned in late April that it jumped to No. 25 in the country, according to rankings compiled by the Blakely Advocacy Institute at the University of Houston Law Center. While the excitement of winning and bringing home trophies is a highlight for these students, they acknowledge that the biggest benefit they receive from these competitions is preparing them for real-world legal work after graduation. 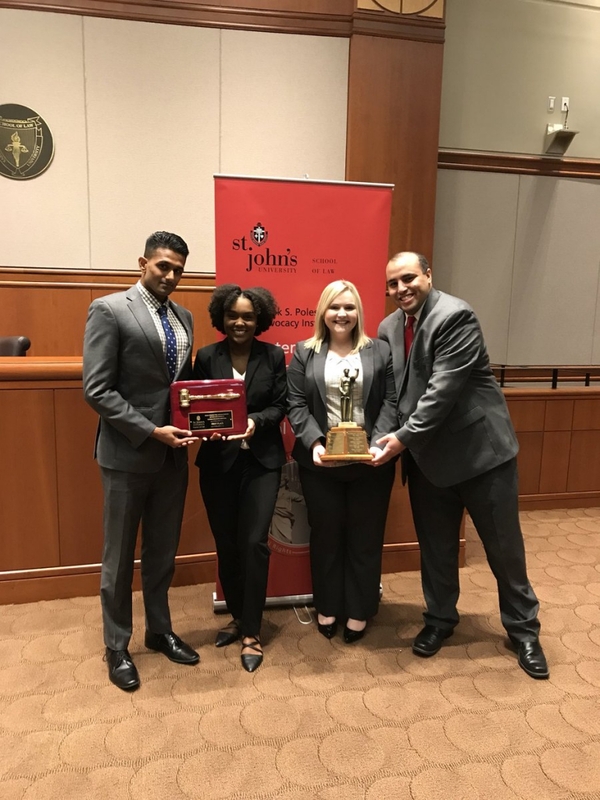 LSU Law’s Civil Rights team of Sohil Sharedalal, Brandi Barze, Meagan Johnson, and Ahmed Soussi won the Peter James Johnson National Civil Rights Trial Competition on Oct. 22 at St. John’s University School of Law in New York City. Kuebel, who will graduate this June and work in maritime law, said these competitions have given her real trial experiences that law students can’t get in a classroom. By traveling and meeting students from law schools across the U.S., she said she got to connect with other future lawyers who will also practice in maritime law and see how she measures up. The future of the moot court and trial advocacy program is bright. Brooks said he is building the program’s new transactional and alternative dispute resolution teams, expanding LSU Law’s internal training programs, offering a new series of skills workshops designed to foster critical lawyering skills, and lining up alumni guest speakers to discuss strategies for success in the courtroom and in the boardroom.